After Al Gore gave everyone an unforgettable lecture in the Oscar-winning An Inconvenient Truth, environmentally conscious and “green” films/documentaries flooded the marketplace for better and worse. Then, after a few years, the trend died down … decidedly for worse since these kinds of projects almost always have good intentions even if they’re not particularly good films. However, the project detailed below just may kick-start another “green” cinema renaissance. 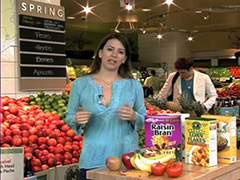 Award-winning author and sustainability advocate Anna Lappé has a new project in the works for aspiring filmmakers in collaboration with Corporate Accountability International, the Real Food Media Project and the Food MythBusters series, viewable at www.foodmyths.org. In fact, it’s a contest dubbed The Real Food Short Film Contest, and it’s inviting filmmakers, or teams of food change-makers working with communicators, to create 30-second to four-minute films in one of four styles: documentary, advocacy, experimental, or wildcard. The judge’s panel has plenty of well-known authorities for film-buffs and foodies to be in awe of including Top Chef’sPadma Lakshmi, Food Inc. Director Robert Kenner and Fast Food Nation author Eric Schlosser. The deadline for entries is 9 p.m. EST on February 3, 2014, andmembers of the public can vote online beginning Wednesday, February 12. Winners will be announced on March 4, 2014. Cash prizes will be given to the 10 best films and the audience choice winner. The top films will be considered for showcasing on the TEDxManhattan website.For more information on each of The Real Food Short Film Contest’s categories, visit www.realfoodmedia.org.